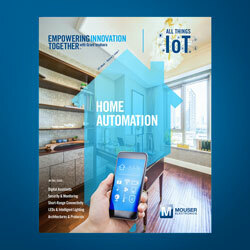 Mouser has released a new e-book targeting home automation as part of All Things IoT, the latest series in the company’s Empowering Innovation Together program. In the first of three e-books in the series, the company’s experts explore the engineering behind the IoT that is automating our offices, industry and homes, and changing the way we live. Topics cover best practices in building a home automation system, intelligent lighting, and comparing short-range communication technologies. The series is sponsored by the company’s valued suppliers Digi International, Maxim Integrated, Murata and TE Connectivity.